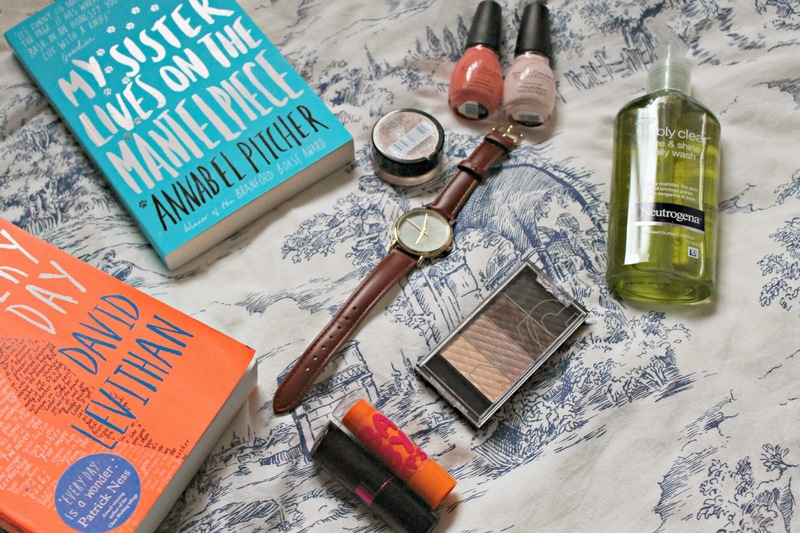 So I've been through all stages of buying this month from make-up to clothes to skincare to books; so ,I thought I would would share what i'd bought with you because it would be rude not to! Maybelline Baby Lips 'Cherry Me' £2.99 - I've been wanting to buy one of the baby lips for ages and when I planned on doing a post including this lip balm, I thought I better go out and buy it! Cherry has to be one of my favourite scents and having it wafting under my nose all day long is heaven! It is such a moisturising lip balm and I love that it has a slight colour pay off. Obviously, being a lip balm, it doesn't have an amazing pigmentation to it but it is just a very subtle colour that is just nice to carry around in your handbag. Collection Lasting Colour Lipstick #13 'Vintage Rose' £2.99- This was definitely an impulse buy as the only reason I got it was because of the pretty name and didn't pay too much attention to the colour as I soon found out it was a dupe for the Kate Moss Lipstick in #19 which I also known. However, it is a good lipstick especially for the cheap price it was so when my Kate Moss lipstick runs out, I have this back up! Sinful Colours Nail Varnish 'Hazard' & 'Easy Going' £1.99- So, it's now autumn so of course I decided to buy some summery coloured nail varnishes! When I saw these in boots I had to investigated because I'd been wanting to try these nail varnishes out for ages but I'd never found the right colours for me because a lot of them are slight sparkly and that isn't the kind of thing I like. But, when I saw these colours I fell in love because I'd been looking for an coral coloured nail varnish for ages and this was perfect for me! I also loved the pale pink 'Easy Going' and it reminded me alot of Essie's Fiji so of course I bought them for the bargain that they were! 'Everyday' by David Levithan £5.75- When me and my mum took a trip into Waterstones, my decided to treat me to these books because she's realised how stressed I've been getting with school and I need something to do when I'm not get annoyed at the amount of work I had. This book definitely caught my eye with the fluorescent orange cover. The book is about a person who is neither a boy nor girl or has a name but each day they wake up in another person's body and spends the day as that person. They'd spent their life getting on with what they had to do until they fell in love and things started to change. I'm in the midst of reading this book and I'll definitely review it after. 'My Sister Lives On The Mantelpiece' by Annabel Pitcher £6.99- Annabel Pitcher is the same author who wrote 'ketchup clouds' which I loved so I was eager to read this book! It's about the aftermath of an accident that occurred. The blurb doesn't give much away but it's supposed to be a great book so we'll have see! Neutrogena 'Pore and shine' Daily face wash £4.49- I have nearly run out of my amazing 'Good Things' face wash so I decided to branch out a little. After loving a few of their products in the past, I thought I would try this face wash by neutrogena which claims to unclog pores and reduce shine. I mainly bought this for the pore aspect to it as I don't suffer with oily/ shiny skin. This leaves my skin leaving nice and soft after a few minutes with it briefly leaving my skin tight but once applying moisturizer it is fine. I haven't used it long enough to see an accumulate difference but I'll just have to give it chance! Primark Shirt £8- My friend was having a festival themes party and I needed a new shirt for the occasion so I headed straight to Primark where I found this beauty! I never have much look with Primark clothes and finding hidden gems like this so I was over the moon when I found this! Urban Outfitters Pinafore Dress £48- When I saw this on Zoella's latest video I had to have it! I feel it's the perfect piece for Autumn and to layer with a white tee and a cardigan and so much more! When it came I wasn't completely sure about it but over the few days I've had it, I've grown to love it and I can't wait to layer this up all through autumn. Urban Outfitters Globe Watch £26 - I've recently had this weird obsession with things with maps on it so when I was in need of a watch an saw this, it was love at first sight! I also feel this is a really good price for a watch especially an Urban Outfitters one!